As of late, my life outside the Blog Universe has geared up to a permanent run. And there is no end in sight - at least for the better part of April. Oh well, I will try my best and get a couple of posts up every week. At least there is again some light even after 5 pm and this allows me to show more NOTDs versus swatches only. 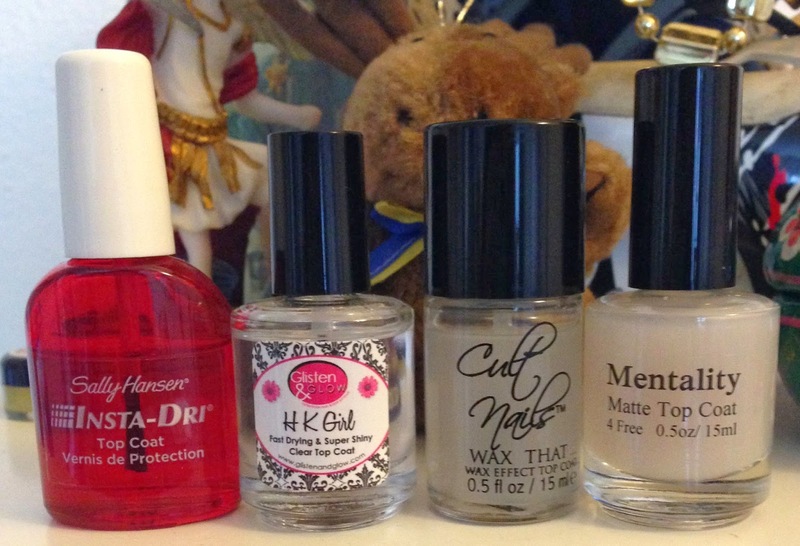 For today I wanted to show you my preferred products for Base and Top Coats. I have read from quite a few Bloggers that they are lucky enough to be able to go with neither Base nor Top Coats but my nail chemistry won't tolerate such an easy go. Base Coat - mandatory (my ridges are bad, bad, bad). And without Top Coat my nails look horrid after one day in the office. 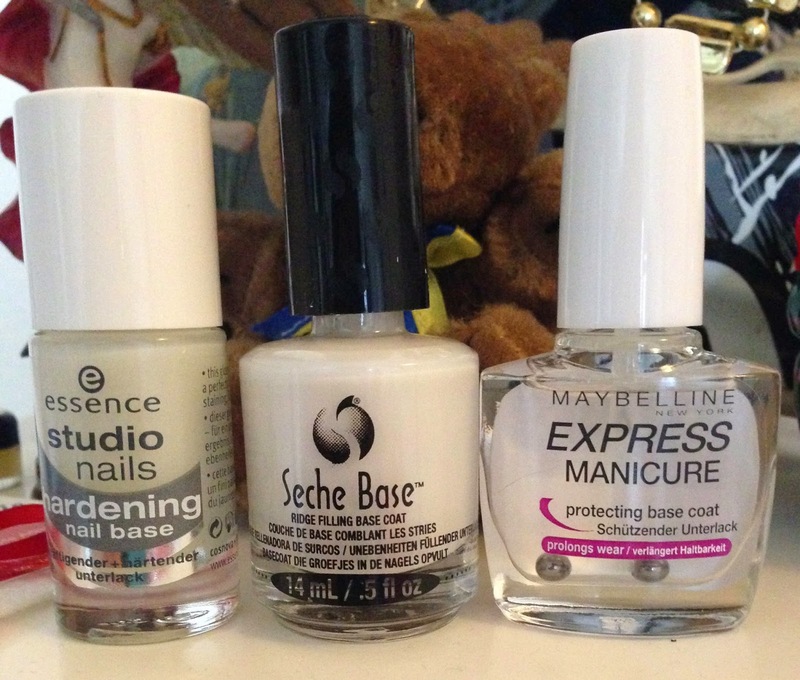 Over the past year or so I have solely and only used Essence XXL Hardening Nail Base. And out of the blue, that rack remained empty in my local Manor since more than 2 months. I haven't heard or read anything that this product will be taken from the range of products and checking the website, they still list it under their current products - however, none of this is any help to me as the rack remains stubbornly empty. Below you see the last picture showing my last bottle of Essence XXL Hardening Nail Base which I gave a way to a friend who has some serious nail breaking issues as of late. Which nudged me into exploratory mode which lead to acquisition of below Base Coats and lead finally to this post - ugh what a sentence!!! Essence XXL Hardening Nail Base: a wonderful Base Coat that comes cheap and not only minimizes my ridges but also the coloring of the nails. The downside (besides its current unavailability) it gets thick after having used half of the bottle and incredibly gloppy after 2/3. I never used up any of their bottles and used to throw them out regularly. Since it is very cheap, it did not really concern me. Seche Ridge Filling Base Coat: this is my latest addition to the team of Backvocals and after two days of use I am still totally exited. It applies slightly milky and dries to a satin finish and seems to have some shimmer particles in it. It dries within the blink of an eye and I so far used it as Base Coats under creams, shimmer and a shimmer fleck polish and now yes, a glitter (I am terrified of the amount of elbow grease required tonight). It behaved well with all of the mentioned finishes and I cannot report any misbehaviors, though I haven't tried it for holos yet. As with Essence XXL Hardening Nail Base, it is easier to apply a not too thin first coat of your polish to prevent patchiness. It smoothed my ridges as good as the Essence Base Coat. I also cannot yet report anything on a possible thickening as the bottle is still filled. I prefer the application of Seche over the one from Essence. The only downside: it is very expensive here in Switzerland, but I was desperate to get a bottle of a decent Ridge Filler and could not wait for an Amazon order to arrive. Maybelline Express Protective Base Coat: this is your regular, clear Base Coat. No ridge filling and no protection from staining the nails. I wore it under a red polish and my nails turned within a day ORANGE - yyyyyks!!!! I also tried to apply a holo polish over it and while it was manageable, I got used to quite a different paint job with my Essence. Overall: an acceptable emergency solution but no way I will reach for it if I have either of the above handy. Not in the picture: Nyx Ridge Filling Base Coat - I should have left this back in the store. It did not satisfy me in any aspect: not really ridge filling, slow drying and picky with what kind of polish it likes. Maybe this is due to my nail chemistry and it will work for you. For me it was a fail. Cult Nails Wax That: dries to a waxy finish. Dry time evidently is not as fast as with the two before mentioned but it protects the wax finish well and I hardly discovered shiny tips after a day of wear. Mentality Matte Top Coat: will create a beautiful, completely matte finish. It dries slightly quicker than Cult Nails Wax That but not as fast as the first two. As with all of the matte-matte finishes I wore, I observed shiny tips after a day of wear. Honorable mention: Cult Nails Wicked Fast - a gorgeous quick drying Top Coat that in my eyes gets beaten by the above by a hairline only. And of course Glitter Gal Gloss Boss (isn't that name hilarious?). Now Gloss Boss is while also quick drying and not diminishing any holo quite different in consistency compared to Sally Hansen and Glisten& Glow - it is remarkable thicker and gel-iish if you know what I mean. What I TOTALLY dislike though is the form of the bottle it comes in - of course the square shape looks cool - but how for nailpolish-sake should I get some of it on my brush once it is is half empty? I can of course dip and bend the bottle - fair enough. Due to the thickness of Gloss Boss though, you might not get enough of it on your brush when you want to seal your bigger nails - with me any nail except the pinkie. So this is why it took a dive into my drawer lately and has not been in use. IMPORTANT: the consistency and/or dry time have not shown any impact despite the half empty bottle - so the product is really good, it just takes its own sweet time to get it out of the bottle once there is a serious dent in it. Oh and another down side, you will use quantity wise a lot more than from Glisten&Glow - given the higher price, I think decision is an easy one here. Phew, that was a lot of text - and there are some not even listed - they still sit unopened in my drawer and I will do a respective review once I used them. Thank you very much for bearing with me to the end of this long, long post - and I look forward to reading any comments!! !